Congratulations, you’re about to import people into Tithe.ly ChMS! We’ll give you some pointers below. To view an example of how your information should be formatted, download the file below. There’s sample data for people, custom fields, demographics, departments and locations. Alternatively, if you’re just wanting a template with the built-in fields that can be imported the following file will be useful. Most databases will generate an individual ID number upon export. Retaining this ID can be useful during the importing process, particularly if you have to do multiple imports. It can can help match new data to the correct person in the system in cases where you have hyphenated names or people with the same first and last name. If you’re wanting to work with an old database ID, create a custom field for the script to match upon import.This can be deleted when you’re done! HINT: the inbuilt ‘Member ID’ field within the import script is the Tithe.ly ChMS Member ID. Don’t mistake this for the custom ID field when matching upon import! When setting up your People Categories, you would’ve had the option to create custom fields in the system. Upon import, you can choose what columns relate to the particular custom fields. If you are importing into a custom field that has multiple options (e.g. a dropdown custom field or a custom field with checkboxes), then make sure you enter the name of the values exactly as they are displayed in the system. Add multiple values by separating them with commas. It’s possible to link family members together through family identifiers upon import, too. This identifier could be a single digit or a string of characters – the important part is that they match all other members of the family. For example, all the people in the list below with the number 1 in the ‘family identifier’ column will be linked as a family in Tithe.ly ChMS and so on. 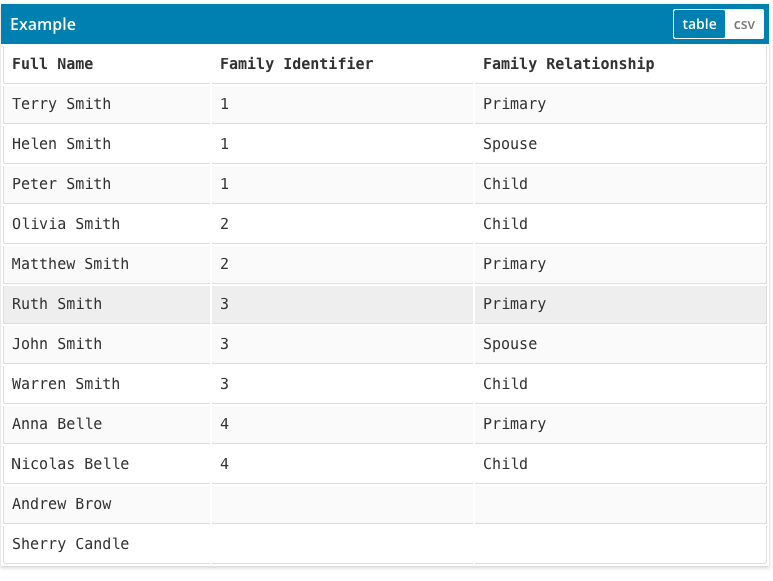 If the ‘family identifier’ column is left blank, the person will not be grouped into a family. To set family relationships in the system through import, match individuals with their family relationship. This could be either Primary, Spouse, Child, Sibling, Grandfather, Grandmother, Partner or Other. HINT: Other databases may have recorded family relationships differently with words such as ‘husband’ or ‘wife’. Make sure you convert these to ‘Primary Contact’ and ‘Spouse’ before importing to ensure the information is preserved! Marital Status can be recorded against a person in the system. Within your import file, utilize the following values: Single, Engaged, Married, Partner, Widowed, Divorced and Separated. It’s important to note that other databases may record these titles differently, so once again be sure to check they’re spelt and defined correctly! If your previous database exports a column showing if someone is either archived or a contact (ie some use a 1 in the column), use the ‘Find and Replace’ tool to put a Yes in the column for those you wish to import accordingly. The first option allows you to place the names into one column. If a person has more than one value, separate them by commas. Alternatively, you can choose to import this information from individual columns. This can be done by putting one character (e.g: the letter y) within the areas (e.g: Departments, Demographics, Locations) that the person is assigned to. From the above example, it can be seen that John will be assigned to the Hosting and Worship Departments. Jimmy the Hosting Department and Joseph the Kids Department. To perform your import, log in to your Tithe.ly ChMS account and navigate to the Admin Area. Click on People → Import, and when the page has loaded, select your import file to upload. From here, select that you would like to import ‘People’ and then choose your date format. Once done, click ‘Continue’. Once all columns have been matched to their Tithe.ly ChMS counterpart, scroll to the bottom to configure how the script is to handle new and duplicate people. Double check that your columns match correctly. From here, you’re good to go! Click the ‘Import’ button. This may take some time, once again depending on file size and how many records you are importing. Once your import is complete, you should receive a notification and a record of how many records were updated. Please note, if your Member Directory settings are set to automatically add people and require confirmation before being added, you will be asked if you want new people in the import to receive these emails or to be automatically added to the directory. We recommend turning this off when importing.